Actor Jim Carrey was originally tapped to play the lead role in Steven Spielberg’s Jurassic Parkin 1992, but he lost the part to Jeff Goldblum. The funnyman was called in to audition for the role of mathematician Dr. Ian Malcolm in 1992, when producers were readying the dinosaur classic – however Carrey failed to win over the casting director, Janet Hirshenon. Actress Laura Dern also spoke about her casting process during the interview, revealing she only signed onto the project after appealing to her former co-star Nicolas Cage for advice. Hollywood newcomer Colin Trevorrow has been unveiled as the director of the new Jurassic Park movie. Rumors have been swirling about who would oversee the fourth installment in the popular sci-fi adventure franchise, ever since Steven Spielberg announced it was in the works in 2011. Spielberg, who directed the first two films in the series, has already signed up as an executive producer for the 3D project. On Thursday it was announced that Trevorrow will take charge of the long-awaited follow-up to 2001’s Jurassic Park III. Trevorrow is best known for directing 2012 independent movie Safety Not Guaranteed. Steven Spielberg’s Lincoln dominates the Oscars nominations this year with nods in 12 categories, including Best Picture and Best Adapted Screenplay. Spielberg picked up a Best Director nomination, while Daniel Day Lewis earned a Best Actor nod for his turn as the 16th president. Sally Field and Tommy Lee Jones also scored Best Supporting nominations. In second place with a total of 11 nominations is Ang Lee’s Life of Pi. The film is up for Best Picture, Best Director and Best Visual Effects among others. With 8 nominations apiece, Les Miserables and Silver Linings Playbook tie in third. Both are up for Best Picture. The Oscars will be held on February 24. The Twilight Saga: Breaking Dawn – Part 2 continued its reign at the top after raking in $43.1 million. The final movie of the hugely popular vampire franchise, which stars Kristen Stewart and Robert Pattinson, held off competition from Daniel Craig’s Skyfall for the second week in a row to retain the number one spot. The Bond film remained at two with takings of $36 million. Steven Spielberg’s historical epic Lincoln clung onto third place with earnings of $25 million, while fantasy film Rise of the Guardians entered in fourth place with $24 million and adventure movie Life of Pi premiered at five, taking $22 million. Bros. and Yahoo!, along with other donors. of the Wicked Witch of the East after Dorothy’s house falls on the witch. anonymously to the Smithsonian in 1979.
by auction house Profiles in History. opening in 1939, the same year “The Wizard of Oz” premiered. After attending a gala film premiere Sunday night, the Duchess of Cambridge stepped out of the public gaze on Monday to celebrate her 30th birthday in private. (Jan 8). The former Kate Middleton turned heads – and dominated Britain’s Monday morning front pages – by attending the London opening of Steven Spielberg’s “War Horse” wearing a full-length lacy evening gown by Alice Temperley. Her husband, Prince William, used an umbrella to shield her from the rain. War Horse, starring Emily Watson, Toby Kebbell, Benedict Cumberbatch, David Thewlis and Tom Hiddleston, opens in theaters Sunday, December 25. 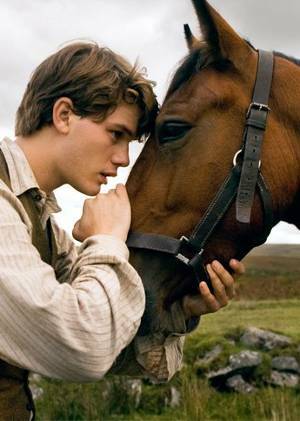 The drama, set in Europe during World War I, tells the story of the strong bond between a young man and an extraordinary horse named Joey. The cast of Steven Spielberg’s World War I epic War Horse converged on NYC for a star-studded red carpet premiere. The film stars Emily Watson, David Thewlis, Peter Mullan, Niels Arestrup, Tom Hiddleston, Jeremy Irvine, Benedict Cumberbatch, and Toby Kebbell. Opens in theaters December 25. Scenes of a train crash in Steven Spielberg ‘s new film Super 8 are of extreme significance in the movie mogul’s life – because the first thing he shot on camera was his model trains colliding. The filmmaker acts as producer on the movie and he admits it was a caboose collision that first got him interested in the art of making movies as a kid. He tells Entertainment Weekly magazine, “I was denied a chance to break my trains for the 20th time. My dad said, ‘You break your trains one more time, I’m taking the set away.’ “So I took my dad’s moviecamera and staged the final train wreck… I shot one train going left to right, and the other train going right to left, and then shot both running into each other.